Baby Sleeping Through the Night: Top Tips to Make it Happen. These tips are from real moms who have been there. Get baby to sleep through the nighttime. While a baby will not sleep through the night util he or she is read to do so, there are several steps you can take to help enable baby to be ready as fast as possible. Sleeping through the night is not just a wait it out game; there are simple things you can do to help baby sleep through the night. Before you aim for a goal of “get baby to sleep through the night,” you need to first define that for yourself. For most people, they do not call it sleeping through the night unless baby is sleeping at least eight hours without waking. Some may even take it so far as 10-12 hours straight. Even a newborn can sleep through the night if you take the eight hour definition. A baby as young as 7-8 weeks old can sleep 7-8 hours at night without a feeding. While some newborns will sleep through the night (or STTN), there are definitely babies who are not ready to sleep through the night at that age. Even if you do everything “right” and apply all of the best tips, you might not have baby sleep through the night until 3-4 months old. There are also babies with various medical difficulties that make it so your infant will not sleep through the night until six months old or older. The first year is the time to set up healthy sleep habits for your little one. The sooner you start to implement healthy sleep habits, the better for baby all around. Also, the sooner you start, the sooner baby will sleep through the night. I asked moms of babies who slept through the night early what they thought their success was. 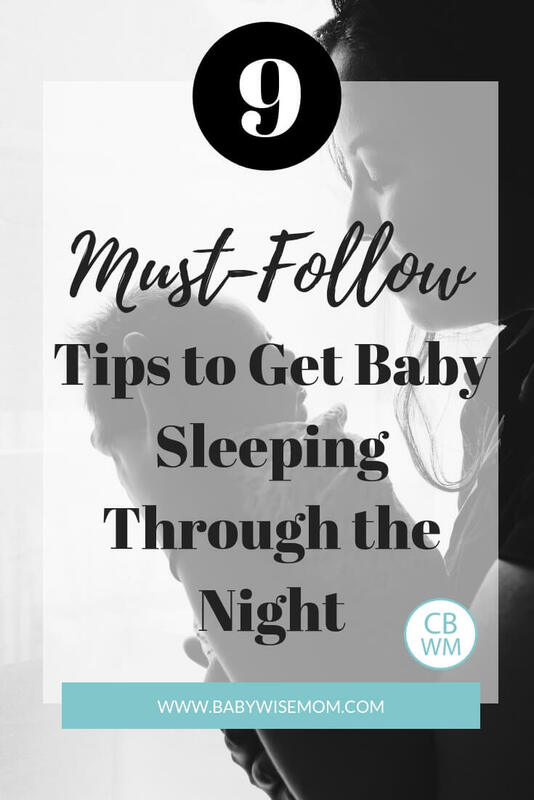 Here are the top tips from real moms to get your baby sleeping through the night. By far, the most common comment from moms was to have consistency. Consistent days, consistent feedings, consistent waktime lengths, consistent daily schedules…keep everything consistent. For help getting a consistent schedule, see my post Getting a Consistent Schedule. Your baby will need to eat in the night, at least for the first couple of months. Carrie had a unique idea for feeding baby at night. Baby can’t not eat at night if baby isn’t getting full feedings during the day. Be sure baby is getting a full feeding and feed baby on a consistent schedule. Typically, you will feed a baby every two and a half to three hours. Feeding a sleepy newborn isn’t always easy. 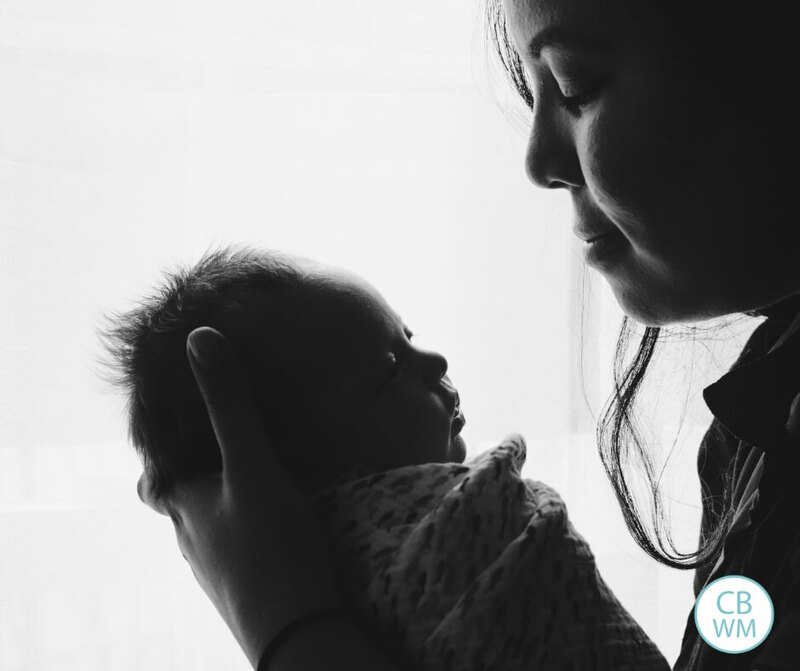 See my post How to Feed a Sleepy Newborn for help. This is one of the key tips for people to pay attention to. The importance of it often gets overlooked. Babies sleep a lot. It can be hard to wake your sleeping baby in the morning, especially if you want to sleep in. Get baby up at the same time each day if you want to have baby sleeping through the night. Every 45 minutes, baby transitions through sleep cycles. If baby can put him/herself to sleep alone, he is more likely to go right back to sleep at that transition rather than wake up with need to help fall back asleep. A consistent bedtime is as important as a consistent morning wakeup time. Read How to Help a Baby With Gas Pain for help. 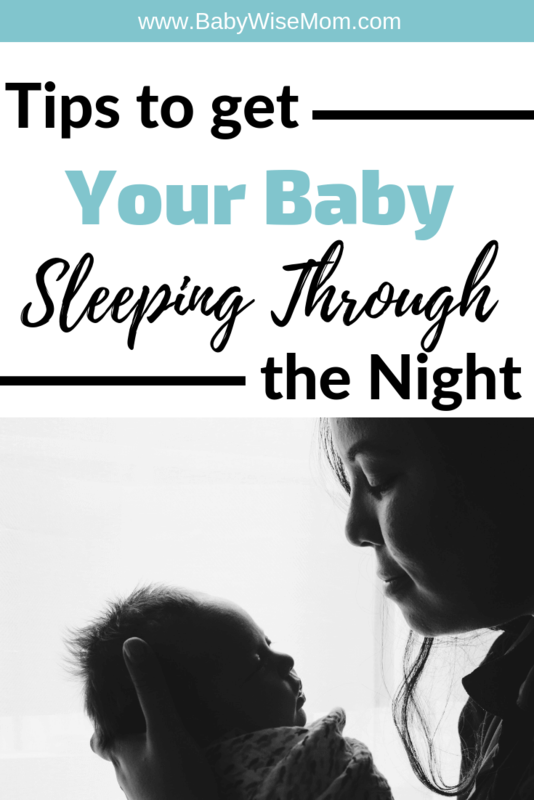 These tips will help your baby sleep through the night. As your little one reaches developmental milestones, they can sometimes set baby’s sleep back a bit, but baby will quickly get back on track. Hello! My LO is 6 months and we have been doing babywise consistently since about 3 months. He is STILL not STTN even though I’m doing all the things listed above… I’ve tried Ferber and extinction but he will cry for 3 + hours. Luckily he’s only waking once at night, but he doesn’t seem like he can make it all night without a feeding. What am I doing wrong?!? If he seems hungry at night, I would focus on putting effort into getting food into him during the day so he doesn’t need it at night. Do you do a dreamfeed? If not, that might help. I would also suggest you look into comfort — is he dressed best for him? Does he need the room warmer or cooler? Good luck! Hi! I have a 3 week old who has been on the 2.5 hour EWS cycle for a week with a consistent wake up and bedtime. We are working hard for full feeds, we are up to 7-9 minutes on each side (he’s EBF). When should I start watching the clock to schedule naps and such? He only sleeps 45-60 minutes at night, but will sleep 1.5-2.5 hours during the day. We try to put him down awake in his crib for most naps. We follow the 4S system and let him fuss for up to 5 minutes if necessary (but pick him up if he’s hysterical since he’s still so young). Any suggestions on how to fix the short night sleep times? Thanks!!! Hello! Congrats on your little one. The first thing I would do is analyze how daytime and night time are different for your baby. Is he dressed differently? Is the temperature different? Could he be not getting burped well enough at night and gas is waking him? I would try to replicate the night environment to the day as much as possible. That helps eliminate factors that can affect sleep.